The Written Nerd: Join the Book Nerd posse! Join the Book Nerd posse! You can now purchase your own Book Nerd T-shirt! Just imagine -- bookish types walking around, all over the country, with their hair-band/L.A. gangster/motorcycle-mob typeface t-shirts, proclaiming their unrepentant book nerdism. It's a beautiful thing. 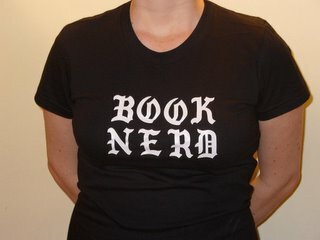 1) Several people have asked where they could get their own Book Nerd shirt like the one in my profile photo. Since that was something the ALP had custom-made for me, I didn't have anywhere to send them. Now I do. 1) I'll make a couple of bucks on the sale of each t-shirt, which will go straight into the Future Bookstore Fund. It's not likely to be a major source of funding, but the overhead price is right (i.e. nothing), and I figure it can't hurt to put it out there. I know the prices are a little steep for t-shirts. The base price for Cafe Press apparel is high, but they do provide all of the infrastructure and product, and they've got a good reputation. And hey -- you can get a shirt for just about the price of a hardcover book. You've got your classic white-on-black option, and an organic white shirt with black lettering. Either one looks pretty darn cool. Do let me know what you think, and especially if you've got ideas for other designs or products I should be offering. Hope you enjoy, my fellow book nerds! I will definitely be getting one of these! I just wish the white t-shirt wasn't "fitted." Book Nerds aren't generally known for being athletic! I hear you, Michael -- fitted T's tend to make me a bit self-conscious, too! But as Cafe Press instructs, you can "size up for a looser fit," and this was the only option if I wanted something organic. Hope it works for ya! I want one of each. XXL. The thought of a black T shirt requires some new thinking on my part. I'm conservative on clothing, as on most things. Will you autograph them, like my Ronnie Lott jersey?